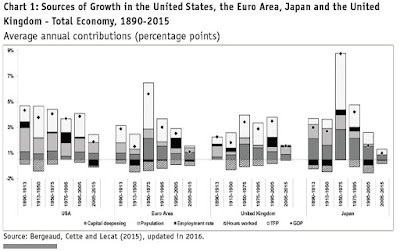 The overall growth of a countries GDP can be divided into five categories: growth of population, change in employment rate, change in hours worked, "capital deepening" (change in capital per worker), and growth of productivity (here measured by total factor productivity or GDP). Antonin Bergeaud, Gilbert Cette, and Rémy Lecat use this framework to review "Total Factor Productivity in Advanced Countries: A Long-termPerspective," in the Spring 2017 issue of International Productivity Monitor (vol. 32, pp. 6-24). This useful figure shows the breakdown of the five factors, looking across the United States, the euro area, the United Kingdom, and Japan. The perspective here is long-term, from 1890 to 2015, so we are talking about big changes in patterns, not about shorter-run effects of recession and recovery. What are some of the patterns that become apparent in the figure? The employment rate is shown by the black portion of the bars. At various times in the past, a higher employment rate contributed to a rise in GDP: for example, in the US economy from 1975 to 1995 women are entering the (paid) labor force in substantial numbers. But in the most recent bars for the 2005-2015 interval, the employment rate is either negative or very small. The bars have three other shaded areas, which from darker to lighter I'll refer to as gray, silver, and white. The gray portion of the bar shows "capital deepening," which is the rise in capital/worker. This is consistently a positive force in raising growth. It was especially powerful in the post-World War II years in Japan and the euro area. In recent years, with low investment rates, it has tended to make a smaller contribution. The silver portion of the bar is population growth, which has become very small in the UK, euro area, and Japan, although it is comparatively larger in the United States. Finally, the white portion of the bar is "total factor productivity," which is the growth in productivity that remains after stripping out these other factors. It's useful to be clear on this point: productivity is not measured directly, but instead is calculated as what is left over after other forces are accounted for. In a classic line from the growth economist Moses Abramowitz, productivity growth is "the measure of our ignorance. education and technological shocks, significantly reduce the share of 20th century GDP growth that is unexplained. Nevertheless, still this share remains important, which suggests that there is scope for further analysis to better measure TFP [total factor productivity] growth." Thus, the unsatisfactory measure of our ignorance is that productivity has slowed down, but we don't really know why. One hypothesis is that errors in measurement mean that current productivity growth and investment is underestimated, but this explanation is controversial. For an extended discussion, see the the symposium on "Are Measures of Economic Growth Biased?" 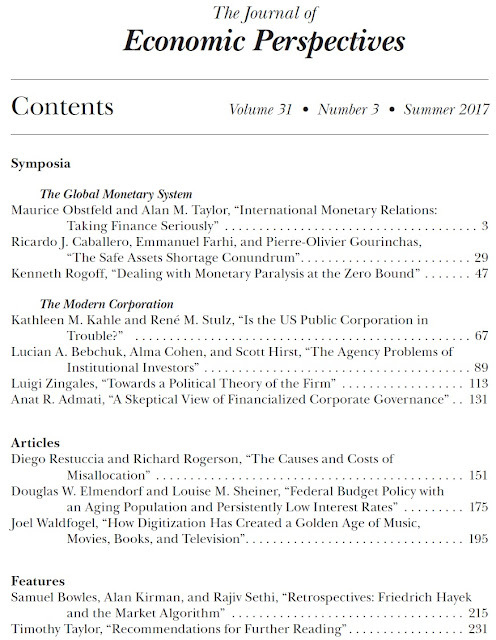 in the Spring 2017 issue of the Journal of Economic Perspectives, with papers by Martin Feldstein ("Underestimating the Real Growth of GDP, Personal Income, and Productivity"), Chad Syverson ("Challenges to Mismeasurement Explanations for the US Productivity Slowdown"), and the team of Erica L. Groshen, Brian C. Moyer,Ana M. Aizcorbe, Ralph Bradley and David M. Friedman ("How Government Statistics Adjust for Potential Biases from Quality Change and New Goods in an Age of Digital Technologies: A View from the Trenches"). "One explanation being tested is that this weaker cleansing mechanism could at least partly be explained by a decline in real interest rates and less expensive capital, which allow low productivity firms to survive and highly productive firms to thrive. Less expensive capital lowers the return on capital expected from firms and allows innovative firms to take on more risks. But this could also contribute to capital misallocation, as financing becomes less selective on the main innovative projects. Recent researchers have found that such an explanation may be relevant for Southern European countries such as Portugal, Italy and Spain ..."
In other words, when interest rates are so very low, the pressures to lend mostly to those firms with really good economic prospects is diminished, and lower-productivity firms feel less pressure to upgrade. I'm not confident that this answer applies very well for the US economy, but then, I'm not sure what other answers to offer, either. "The Limited Liability Corporation is the Greatest Single Discovery of Modern Times"
Economists and other gossipmongers sometimes like to quote the words of Nicholas Murray Butler, who was at the time President of Columbia University, in a 1911 speech called "Politics and Economics" to the 143rd Annual Banquet of the Chamber of Commerce of the State of New York in 1911 (pp. 43-55), and available through the magic of the HathiTrust Digital Library, . "I weigh my words, when I say that in my judgment the limited liability corporation is the greatest single discovery of modern times, whether you judge it by its social, by its ethical, by its industrial or, in the long run,—-after we understand it and know how to use it,—by its political, effects. Even steam and electricity are far less important than the limited liability corporation, and they would be reduced to comparative impotence without it." The fact of the matter is, and it may just as well be recognized in this country and in every other country, that the era of unrestricted individual competition has gone forever. And the reason why it has gone is partly because it has done its work, partly because it has been taken up into a new and larger principle of co-operation. What happens in every form of organic evolution is that an old part no longer useful to the structure drops away, and its functions pass over into and are absorbed by a new development. That new development is co operation, and co-operation as a substitute for un- limited, unrestricted, individual competition has come to stay as an economic fact, and legal institutions will have to be adjusted to it. It cannot be stopped. It ought not to be stopped. It is not in the public interest that it should be stopped. "I read that to illustrate that the business and political mind of Europe has been on this question for at least four hundred years. ... . We must learn that economic laws, economic principles, based on everlasting human nature are fundamental and vital, and your care and mine, as citizens of this Republic, is not to interfere with these laws, not to check them; but to see to it that no moral wrong is done in their name. That is a very different proposition from the one of overturning a great economic and industrial system by statute." At least for me, the closing paragraph contains food for thought. 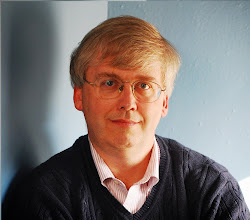 I was hired back in 1986 to be the Managing Editor for a new academic economics journal, at the time unnamed, but which soon was launched as the Journal of Economic Perspectives. The JEP is published by the American Economic Association, which back in 2011 decided--to my delight--that it would be freely available on-line, from the current issue back to the first issue. Here, I'll start with Table of Contents for the just-released Summer 2017 issue, which in the Taylor household is sometimes known as issue #121. Below that are abstracts and direct links for all of the papers. I will almost certainly blog about some of the individual papers in the next week or two, as well. In this essay, we highlight the interactions of the international monetary system with financial conditions, not just with the output, inflation, and balance of payments goals usually discussed. 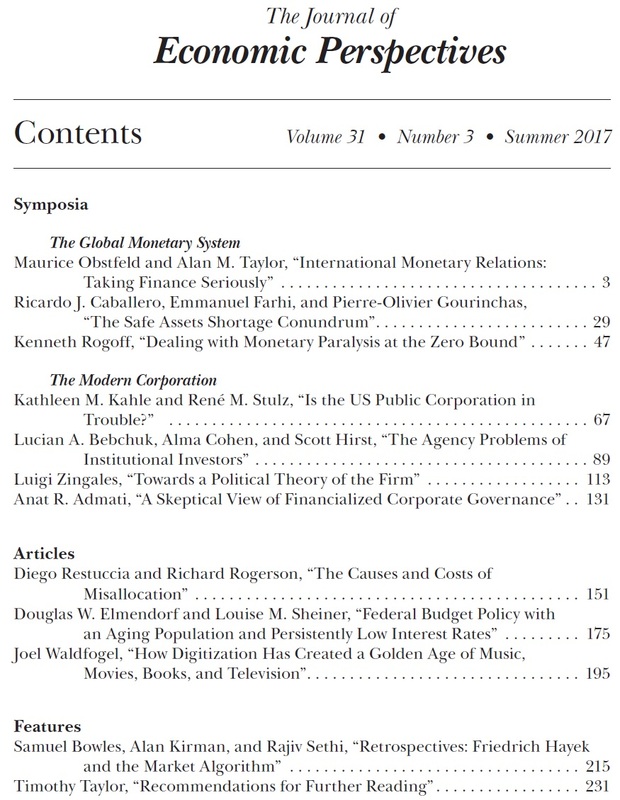 We review how financial conditions and outright financial crises have posed difficulties for each of the main international monetary systems in the last 150 years or so: the gold standard, the interwar period, the Bretton Woods system, and the current system of floating exchange rates. We argue that even as the world economy has evolved and sentiments have shifted among widely different policy regimes, there remain three fundamental challenges for any international monetary and financial system: How should exchange rates between national currencies be determined? How can countries with balance of payments deficits reduce these without sharply contracting their economies and with minimal risk of possible negative spillovers abroad? How can the international system ensure that countries have access to an adequate supply of international liquidity—financial resources generally acceptable to foreigners in all circumstances? In concluding, we evaluate how the current international monetary system answers these questions. We examine the current state of the US public corporation and how it has evolved over the last 40 years. After falling by 50 percent since its peak in 1997, the number of public corporations is now smaller than 40 years ago. These corporations are now much larger and over the last twenty years have become much older; they invest differently, as the average firm invests more in R&D than it spends on capital expenditures; and compared to the 1990s, the ratio of investment to assets is lower, especially for large firms. Public firms have record high cash holdings and, in most recent years, the average firm has more cash than long-term debt. Measuring profitability by the ratio of earnings to assets, the average firm is less profitable, but that is driven by smaller firms. Earnings of public firms have become more concentrated—the top 200 firms in profits earn as much as all public firms combined. Firms' total payouts to shareholders as a percent of earnings are at record levels. Possible explanations for the current state of the public corporation include a decrease in the net benefits of being a public company, changes in financial intermediation, technological change, globalization, and consolidation through mergers. Financial economics and corporate governance have long focused on the agency problems between corporate managers and shareholders that result from the dispersion of ownership in large publicly traded corporations. In this paper, we focus on how the rise of institutional investors over the past several decades has transformed the corporate landscape and, in turn, the governance problems of the modern corporation. 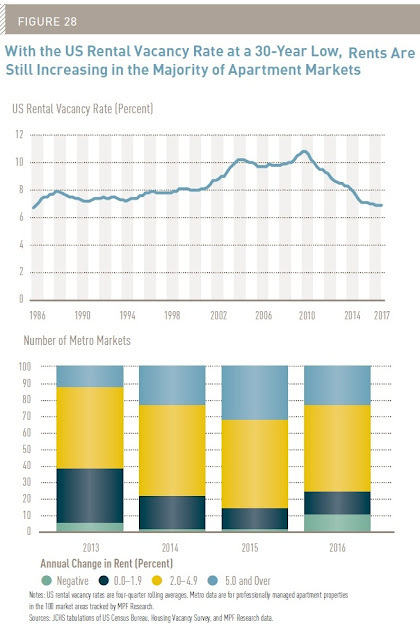 The rise of institutional investors has led to increased concentration of equity ownership, with most public corporations now having a substantial proportion of their shares held by a small number of institutional investors. At the same time, these institutions are controlled by investment managers, which have their own agency problems vis-á-vis their own beneficial investors. We develop an analytical framework for understanding the agency problems of institutional investors, and apply it to examine the agency problems and behavior of several key types of investment managers, including those that manage mutual funds—both index funds and actively managed funds—and activist hedge funds. We show that index funds have especially poor incentives to engage in stewardship activities that could improve governance and increase value. Activist hedge funds have substantially better incentives than managers of index funds or active mutual funds. While their activities may partially compensate, we show that they do not provide a complete solution for the agency problems of other institutional investors. The revenues of large companies often rival those of national governments, and some companies have annual revenues higher than many national governments. Among the largest corporations in 2015, some had private security forces that rivaled the best secret services, public relations offices that dwarfed a US presidential campaign headquarters, more lawyers than the US Justice Department, and enough money to capture (through campaign donations, lobbying, and even explicit bribes) a majority of the elected representatives. The only powers these large corporations missed were the power to wage war and the legal power of detaining people, although their political influence was sufficiently large that many would argue that, at least in certain settings, large corporations can exercise those powers by proxy. Yet in economics, the commonly prevailing view of the firm ignores all these elements of politics and power. We must recognize that large firms have considerable power to influe nce the rules of the game. I call attention to the risk of a "Medici vicious circle," in which economic and political power reinforce each other. The possibility and extent of a "Medici vicious circle" depends upon several nonmarket factors. I discuss how they should be incorporated in a broader "Political Theory" of the firm. Managerial compensation typically relies on financial yardsticks, such as profits, stock prices, and return on equity, to achieve alignment between the interests of managers and shareholders. But financialized governance may not actually work well for most shareholders, and even when it does, significant tradeoffs and inefficiencies can arise from the conflict between maximizing financialized measures and society's broader interests. Effective governance requires that those in control are accountable for actions they take. However, those who control and benefit most from corporations' success are often able to avoid accountability. The history of corporate governance includes a parade of scandals and crises that have caused significant harm. After each, most key individuals tend to minimize their own culpability. Common claims from executives, boards of directors, auditors, rating agencies, politicians, and regulators include "we just didn't know," "we couldn't have predicted," or "it was just a few bad apples." Economists, as well, may react to corporate scandals and crises with their own version of "we just didn't know," as their models had ruled out certain possibilities. Effective governance of institutions in the private and public sectors should make it much more difficult for individuals in these institutions to get away with claiming that harm was out of their control when in reality they had encouraged or enabled harmful misconduct, and ought to have taken action to prevent it. Why do living standards differ so much across countries? A consensus in the development literature is that differences in productivity are a dominant source of these differences. But what accounts for productivity differences across countries? One explanation is that frontier technologies and best practice methods are slow to diffuse to low-income countries. The recent literature on misallocation offers a distinct but complementary explanation: low-income countries are not as effective in allocating their factors of production to their most efficient use. We provide our perspective on three key questions. First, how important is misallocation? Second, what are the causes of misallocation? And third, beyond the direct cost of lower contemporaneous output, are there additional costs associated with misallocation? A summary of our answers is as follows: Misallocation appears to be a substantial channel in accounting for productivity differences across countries, but the measured magnitude of the effects depends on the approach and context. Researchers have not yet found a dominant source of misallocation; instead, many specific factors seem to contribute a small part of the overall effect. Beyond the static cost of misallocation, we believe that the dynamic effects of misallocation on productivity growth are significant and deserve much more attention going forward. Some observers have argued that the projections for high and rising debt pose a grave threat to the country's economic future and give the government less fiscal space to respond to recessions or other unexpected developments, so they urge significant changes in tax or spending policies to reduce federal borrowing. In stark contrast, others have noted that interest rates on long-term federal debt are extremely low and have argued that such persistently low interest rates justify additional federal borrowing and investment, at least for the short and medium term. We analyze this controversy focusing on two main issues: the aging of the US population and interest rates on US government debt. It is generally understood that these factors play an important role in the projected path of the US debt-to-GDP ratio. What is less recognized is that these changes also have implications for the appropriate level of US debt. We argue that many—though not all—of the factors that may be contributing to the historically low level of interest rates imply that both federal debt and federal investment should be substantially larger than they would be otherwise. In conclusion, although significant policy changes to reduce federal budget deficits ultimately will be needed, they do not have to be implemented right away. Instead, the focus of federal budget policy over the coming decade should be to increase federal investment while enacting changes in federal spending and taxes that will reduce deficits gradually over time. Digitization is disrupting a number of copyright-protected media industries, including books, music, radio, television, and movies. Once information is transformed into digital form, it can be copied and distributed at near-zero marginal costs. This change has facilitated piracy in some industries, which in turn has made it difficult for commercial sellers to continue generating the same levels of revenue for bringing products to market in the traditional ways. Yet despite the sharp revenue reductions for recorded music, as well as threats to revenue in some other traditional media industries, other aspects of digitization have had the offsetting effects of reducing the costs of bringing new products to market in music, movies, books, and television. On balance, digitization has increased the number of new products that are created and made available to consumers. Moreover, given the unpredictable nature of product quality, growth in new products has given rise to substantial increases in the quality of the best products. Although there were concerns that consumer welfare from media products would fall, the opposite scenario has emerged—a golden age for consumers who wish to consume media products. The interaction of a bubble in real estate prices with the banking and financial sector drove the US economy into the Great Recession. For an overview of how the US housing market is faring a decade after dysfunctions in housing market finance helped bring on the Great Recession that started in 2007, a useful starting point is The State of the Nation's Housing 2017, by the Joint Center for Housing Studies of Harvard University. 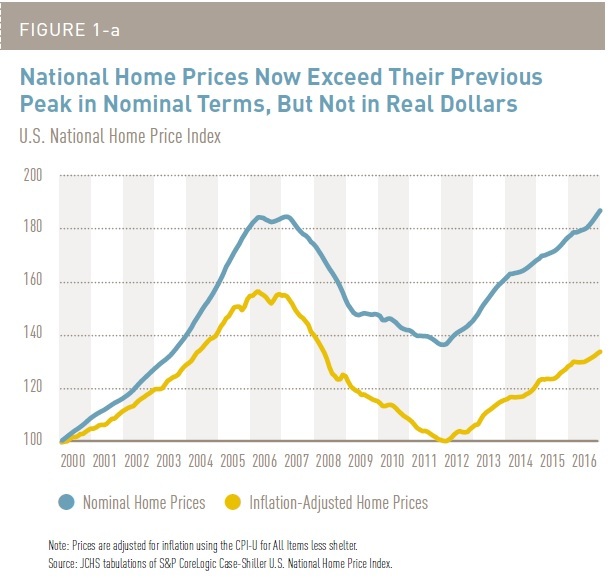 Here's the pattern of overall US housing prices: adjusted for inflation, home prices are about 30% above their level in 2000, but still below where they were at the peak of the housing bubble in 2006. Perhaps not surprisingly, given that pattern, even ten years after the start of the financial crisis in 2007, there there are millions of Americans who are still "underwater" on their mortgages: that is, what they owe is more than what the home would sell for: "According to CoreLogic, the number of households underwater on their mortgages dropped from 4.3 million in 2015 to 3.2 million in 2016, reducing their share of all homeowners from 8.4 percent to 6.2 percent. ... Despite this progress, the share of homeowners with negative equity in some markets is still more than double the national rate. For example, 16.1 percent of homeowners in the Miami metro area were underwater on their mortgages in 2016, along with 15.5 percent in Las Vegas and 12.6 percent in Chicago. At the other extreme, only 0.6 percent of owners in the San Francisco metro area had negative equity." Comparisons like these help to emphasize that price patterns have been VERY different across US housing markets. 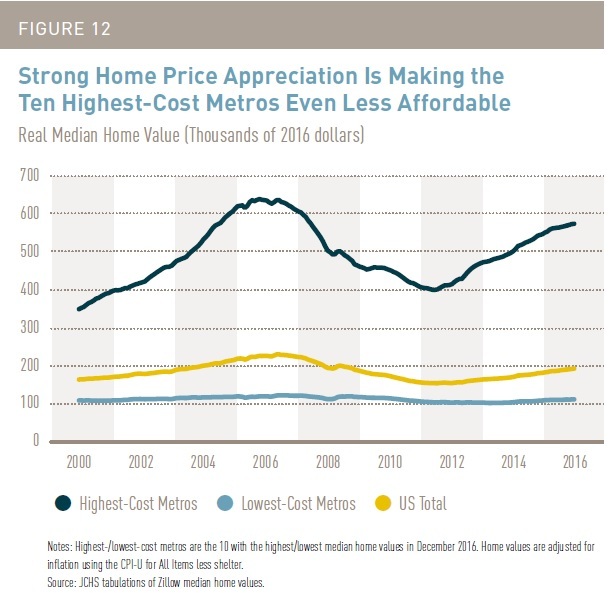 For example, here's one figure comparing the rise in home prices in the ten highest-cost metro areas, compared to the lowest-cost areas and the US average. Clearly, the bubble in housing prices was much more extreme in these high-cost markets. It's also striking that housing prics in the high-cost markets were roughly double the national average in 2000, but more like triple the national average in 2016. 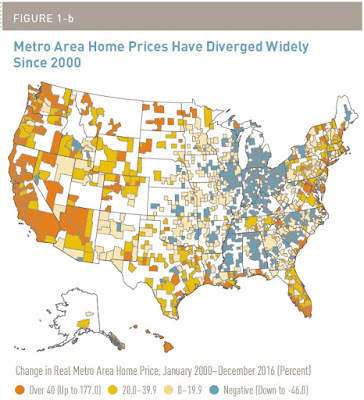 Here's another look at differences in housing prices across local markets using a heat map diagram. The orange areas are places where housing prices rose at least 40%, and sometimes much more, between 2000 and 2016. The blue areas show where housing prices are actually lower, and sometimes much lower, in 2016 than in 2000. One of my takeaways here is that the affordability of housing is in some ways a regional and even a local issue. Whether housing is "unaffordable" is commonly measured by using a rule-of-thumb like the share of people in a given market who could afford the median-priced house if they spent no more than 30% of their income on housing. By this measure, a very high proportion of households at or below the poverty line will face a problem of unaffordable housing in pretty much every real estate market. But in the markets where housing prices are highest and have been rising most quickly, a substantial share of middle-class families can face housing affordability issues, too. I have no problem with federal programs to help those at or near the poverty line afford necessities of life like food, medical care, housing, and so on. But it's not clear that federal programs are appropriate to help those who are not poor, but face an affordability problem because they live in a region with a high cost of housing. It's not clear why those not clear why those who live in Pocatello or Dubuque or Detroit should pay taxes to subsidize the higher cost of living in south Florida or southern California. 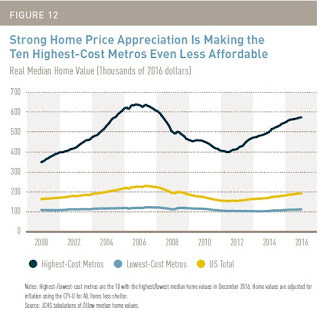 In addition, one key reason why housing prices are so high in certain regions is that local rules can make it costly and time-consuming to build. In short, many of the areas with high housing prices have, to a substantial extent, brought those high costs on themselves by the ways in which they regulate and limit construction of new housing. Again, federal programs to help those with very low incomes is one thing, but when a local area or region has helped to create its own high housing costs, that same local areas or region should also have most of the responsibility for addressing the affordability consequences of those decisions. The theme that housing construction has been relatively slow surfaces in the report in a number of places: "A variety of factors may be holding back a more robust supply response. Labor shortages are a key constraint, reflecting both the substantial drop in the construction workforce following the housing bust and the lower number of young workers entering the industry. In addition, regulatory and stricter financing requirements have limited the supply of land available for both single- and multifamily housing construction. In combination, these forces raise development costs and make it less feasible to build smaller homes for first-time buyers and rental units affordable to low- and moderate-income households." For example, the blue line in this figure shows the "vacancy rate," which is quite low. The yellow bars show how many new houses have been constructed in the previous 10 years, which is also very low. Similarly, the vacancy rate for rental apartments is also quite low, and rents are rising in most metro areas. With low vacancy rates for housing and, at least in certain areas, very high prices, one would expect to see a resurgence of construction. But in a number of local markets, efforts to build additional housing stock is held back substantially by the conditions demanded by existing home-owners and imposed in their name by local regulators. The BP Statistical Review of World Energy is a useful annual volume that compiles tables and charts about about energy production and consumption. The latest version, released June 2017, includes a table at the end on recent and current carbon emissions from oil, natural gas, and coal. As a footnote under the table emphasizes, this does not include all greenhouse gases (for example, methane is not included), nor does it subtract carbon emissions which have been sequestered or offset in some way. Moreover, while other tables and figures in the book offer data on production of hydroelectric, nuclear, solar, wind, and other noncarbon energy alternatives. this table has a different focus. Here's a whittled-down version of the tables: specifically, I took out the annual data on emissions for the years from 2007-2015. Thus, the first column is carbon emissions for 2006; the second column is carbon emissions for 2016; the next two columns show the annual growth rate of carbon emissions for 2016 and for the decade from 2005-2015; and the final column shows each country's or region's share of global carbon emissions in 2016. What are some of the notable patterns here? 1) Anyone who follows this topic at all knows that China leads the world in carbon emissions. Still, it's striking to me that China accounts for 27.3% of world carbon emissions, compared to 16% for the US. 2) On a regional basis, it's striking that the Asia Pacific region--led by China, India, and Japan, but also with substantial contributions from Indonesia, South Korea, and Australia--by itself accounts for nearly half of global carbon emissions. Moreover, carbon emissions from his region grew 3.6% annually from 2005-2015. 3) Again on a regional basis, carbon emissions from North America (that is, mainly the United States) are nearly the same as carbon emissions from the Europe/Eurasia region. For both regions, carbon emissions have been falling at about 1% per year since 2005. 4) Given the large size of carbon emissions for the massive US economy, and the ongoing decline in the last decade, total carbon emissions for the United States have dropped much more than for any other country in the world from 2005-2016. A number of other nations with smaller total emissions have seen a faster annual rate of decline than the United States. But two of the countries which rank among those with the most rapid declines in carbon emissions from 2005-2015--Ukraine and Greece--are surely more about overall macroeconomic struggles than about as smooth transition to noncarbon energy sources. 5) Total carbon emissions from the three regions of South and Central America, the Middle East, and Africa total 14.1% of the global total, and thus their combined total is less than either the United States or the European/Eurasian economies. However, if the carbon emissions for this group of three regions keeps growing at 3% per year, while the carbon emissions for the US economy keeps falling at 1% per year, their carbon emissions will outstrip the US in about 4-5 years. The US unemployment rate has been 5.0% or lower for nearly two years, since September 2015, and the most recent estimates for June 2017 show it at 4.4% in June. For most of my life, an unemployment rate at this level would have been cause for near-riotous celebration. But it's also a time where many workers have had little growth in wages, where labor force participation has fallen, where many jobs are replaceable contract work without any clear career path, where many jobs feel under threat from foreign competition and technology, where the control of employers over workers often feels as if it's on the rise, and where inequality has been on the rise. I've recently run across three comments on US labor markets which get at some of these concerns in various ways, which I'm passing along here. As always, there is more discussion at the links. "I’d like to find some way of enlarging and improving the way workers, wage earners, are represented in their firms. Unions used to do that, but even with the best will in the world, you could not restore the trade union movement. If it’s true, what we all think, that the nature of workers changed, that people who work for many employers in different industries, and different occupations, really have changed, then neither the craft union nor the industrial union is the right policy vehicle. "But of course, the online workers that everybody talks about are the prize case in this. They never have contacts with their employers, who change from day to day, and they have no contact with the other people who work for that employer. ... There’s no shop floor, but for the online worker, it’s clear who the boss is. The boss is the one who pays, as usual. "So what’s the correct, valid form of representation they could have? How could we do something about their voice and about the web of rules in which they operate? Or something about retirement for people who don’t have a single employer for any length of time? What is the right form of representation? I don’t really think it’s having someone on the board of a corporation. It might matter, but it can’t be the whole thing. I think that you need some kind of substitute. Maybe you need a substitute for the shop floor. How can you be part of a group that you never see, never communicate with or anything like that? "It’s that part of the inequality issue that I think doesn’t attract enough thought, and I don’t know how to go about encouraging that. Who would be good at it? Or what happens in other countries? ... I do think the economics of this is important because the object here is not merely to make people feel good but to make them feel effective and be effective in pursuing their own interests. So that, to me, is part of the inequality issue. It’s not so much a quantitative inequality, it’s a fact that the relationship between the boss and the bossed is getting more and more biased toward the boss, and that makes people feel unhappy." "[T]here isn’t that much pressure on companies right now to do as well as they can by their job applicants — to give them information about when the job is no longer available; to give them enough information about what the job will actually be like. There are a lot of complaints among job seekers about how badly they are being treated in the hiring process. ... As advanced as we are technologically, you will see jobs actively posted that were filled a month, two months, three months before, and they’re still out there showing up as potential jobs for people." "There’s two kinds of techno-pessimists. There are ones ... who basically say, the best is behind us, and from now it’s going to be slow going. And then there’s the other techno-pessimists who say, this is going to accelerate and it’s going to destroy us. It’s going to destroy people, it’s going to destroy jobs, it’s going to make us all the slaves of these supercomputers. They can’t both be right. Maybe the truth is somewhere in the middle. Now the other thing of course is that it’s not so obvious that these people aren’t going to work. I refer both of you to a survey essay that was published last week in The Economist, in which they basically point out that we may be looking at a large proportion of the population, particularly people in the 65 to 74 age bracket, who are basically fit to work, want to work, and there is no reason why they shouldn’t work — but only if we can change the institutions of society that have been systematically discriminating against them. Cities evolve. Sometimes they boom, with strong growth in center-city areas. Sometimes the center city seems to hollow out, but economic activity in the metro area as a whole, including suburbs, remains fairly robust. Sometimes older neighborhoods with low property values experience as wave of new investment in residential housing, often called "gentrification." Sometimes both a downtown area and its surrounding metro area decline. In addition, these patterns seem to affect a number of cities at the same time. Santiago Pinto and Tim Sablik discuss one aspect of these cycles in "Understanding Urban Decline," an essay that appears in the 2016 Annual Report of the Federal Reserve Bank of Richmond. 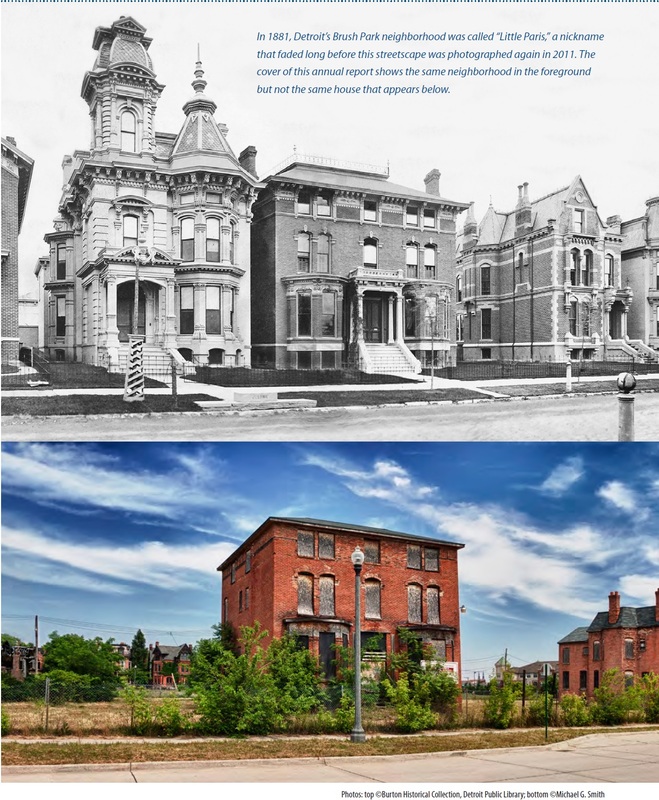 As a dramatic opening, here's a picture of a house in Detroit's Brush Park neighborhood as it appears in 1881, and then when a photo was taken from the same perspective in 2011. The house in the middle is the one from the earlier picture. The houses on either side are long gone. Detroit is obviously an extreme example, given that its economic base was so closely tied to the auto industry. But it's far from the only example of an urban area that suffered a severe downturn. The underlying economic theory of cities points out that they offer advantages of agglomeration: that is, it's a lot easier to carry out certain activities of production, hiring, marketing, entertainment, provision of infrastructure, and transportation, when people are bunched more closely together. Thus, urban areas are engines of economic growth. There are also negative aspects of agglomeration, in that traffic congestion, crime, noise, and other negatives are also easier to carry out when people are bunched together. So cities are in a constant struggle to build on the advantages of agglomeration while mitigating the disadvantages. The preferences of people interact with the economics of cities, and in particular, how people trade off different aspects of location. For example, people will place different values on their location relative to their job and the length of their commute, the cost of a place to live,high quality local-schools, a quiet and low-crime neighborhood, a bustling urban neighborhood, mass transit, shopping, parks and libraries, culture/entertainment/sports, and neighbors with certain types of income levels or ethnic mixes. As is true in so many life decisions, you can't always get all of what you want. As people with different income levels and jobs and preferences make these choices, urban patterns will emerge. "In most U.S. cities, wealthier households tend to live farther away from the city center, though there are a few notable exceptions (such as Chicago, Philadelphia, and Washington, D.C.). One explanation for this is that wealthier households prefer to occupy more land and therefore are willing to live in the suburbs despite higher commuting costs because the price of housing per square foot is lower. On the other hand, when a household’s income becomes sufficiently large, it may choose to move back to the city center to reduce time spent commuting. This type of trade-off could explain, for instance, why both very poor and very wealthy households are found living in some downtowns. Cities such as Boston, New Orleans, Atlanta, and Philadelphia are examples of this type of spatial pattern. Additionally, public transportation can help explain why poorer households live in the city center. Although the cost of housing per unit of land is higher in the city, public transportation allows poor households that don’t have access to cars to economize on transportation costs. "Transportation may further explain the trend of households moving from city centers to the suburbs, often called suburbanization. Several studies suggest that the development of the highway system contributes to “urban sprawl.” One study estimated that just one highway passing through a central city reduces its population by 18 percent. Cities that experience such a decline in commuting costs do still tend to attract population, but that inflow typically causes the city to expand geographically more than it increases the number of people living in the city center. "Because buildings are durable goods, it can take a long time for a city to move through its lifecycle. When a city’s population is growing, it is profitable to construct new housing because demand and prices for housing are rising, and the city expands rapidly. But when the population declines, existing housing stock doesn’t simply disappear. It can take decades before it is profitable to refurbish or replace a building. The surplus of housing depresses house prices below the cost of construction, and the city stops growing. Moreover, falling rents may draw lower-skilled and lower-income households into the city, intensifying urban sorting by income." "If policymakers decide that some intervention is warranted, there are a number of different approaches they could consider. One option is to focus on helping households by giving them the tools to improve their situation. This could involve removing barriers that prevent households from relocating to thriving parts of the city, providing housing vouchers to help them move, or improving transportation networks to reduce commuting costs. An alternative approach is to focus on revitalizing the city itself. This includes revitalizing residential or commercial buildings that have declined or offering incentives to employers to locate in the city and hire local people. Economists have labeled these different approaches people-based and place-based policies, respectively." However, as Pinto and Sablik discuss, the evidence on the effectiveness of either people-based or place-based approaches is fairly weak. For example, people-based policies include idea like "moving-to-opportunity" programs that subsidize people in depressed urban areas to relocate to other parts or the urban area. Such programs seem to help young children, but the effects on other age groups are minimal or even negative. Improving the quality of local education is a worthwhile goal, but hard to accomplish. place-based approaches like "enterprise zones" or "urban renewal projects" sometimes show an effect in the specific area that is targeted for the policy, but even when the effects seem positive for that area, a common finding is that economic activity was just relocated. from other nearby areas. Every city has areas where incomes are lower and social problems are higher, and the geographic location of those areas often seems to remain the same for decades at a time. This experience suggests rather strongly that we don't have any magic-bullet policy tools that will target these areas with strong local economic activity and addressing issues like crime. I worry that some cities have a tendency to focus to much on a magic-bullet solution--the single big project or law that will address problems in part of a city. Instead, cities might be better off if they would focus on providing a decent level of public services to all areas of a city: safe public areas and parks, cleaning up garbage, street repair, well-functioning schools, enforcing the housing code, libraries and post offices, and the like. Moreover, a city can play a big role by whether it encourages or discourages people and firms who want to upgrade the base of real estate in a certain area of a city, whether it's for business or residential uses. Finally, readers interested in the evolution of urban areas might also want to look back at "Economics of Gentrification" (December 6, 2016). 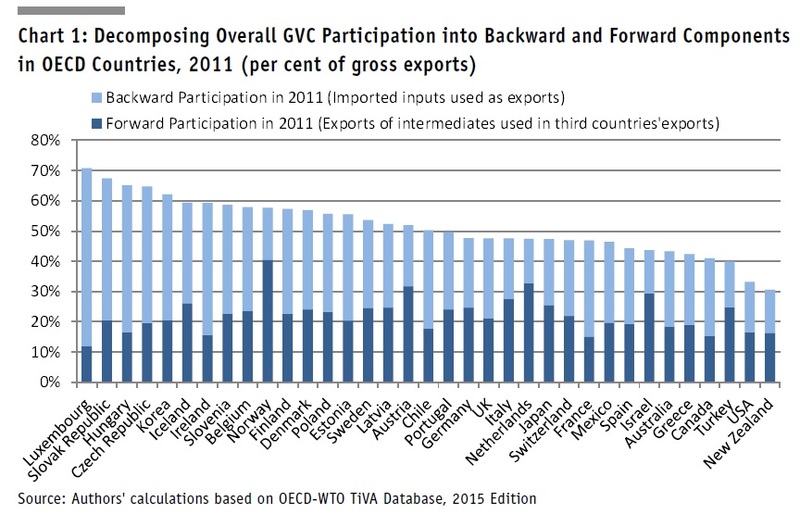 "Economies can participate in GVCs [global value chains] by using imported inputs in their exports (the so-called backward linkages in GVC) or by supplying intermediates to third country exports (forward linkages). 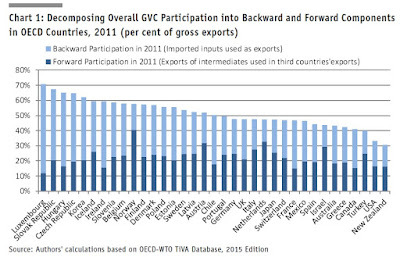 The overall participation in GVCs which is the total of backward and forward participation differs substantially across countries. 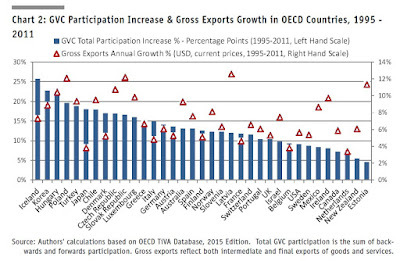 Overall participation measure (measured as the sum of backward and forward linkages) reflects the importance of GVCs for an economy, with GVCs accounting for between one-third and two-thirds of gross exports (of goods and services) for OECD economies in 2011 ..."
In the next figure, the blue bars showing the growth of global value chains across countries, while the red triangles show the growth rate of exports. 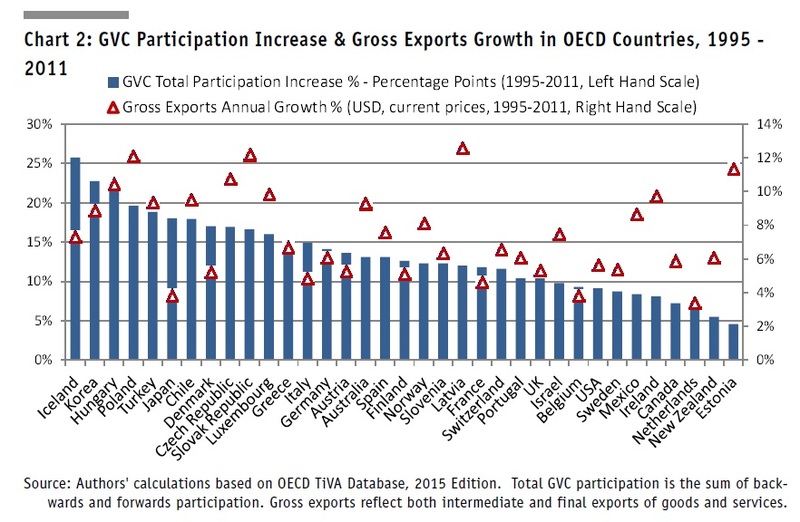 The growth of global value chains is consistently faster than growth of exports, although you have to look closely at the figure to see this, because the blue bars are measured on the left-hand axis and the red triangles with the smaller numbers on tgghe right-hand axis. The bulk of these global value chains are regional: in particular, there is an east Asian cluster of value chains, a European cluster, and a North American cluster. There's some evidence that the growth of these global value chains may have slowed in the last few years, although this is a subject of ongoing research. One possible reason is that "there may also be changes in the structure of global production networks, such as China's domestic upgrading and the reorganization of East. Asian value chains, or the shortening of value chains to mitigate supply chain risks and rising labour costs in emerging economies." "To participate directly in GVCs requires scale. For the largest, most productive firms that are able to export, access to new customers in foreign foreign markets can not only lead to increased learning and innovation but also incentivize complementary investments and the restructuring of internal processes to meet the additional demand. ... Upscaling may yield productivity gains. The cost of many productivity-enhancing investments, including those concerning GVC participation listed above, is largely fixed. Such investments are only viable for sufficiently large firms that can spread the fixed costs over high sales volumes. Firm upscaling may therefore contribute to productive investments." One of the preeminent economic problems of our time is slow economic growth. Given that global value chains have expanded rapidly and seem to contribute to growth, would disrupt these production chains should face a high degree of skepticism. Here's the dilemma: On one side, it seems important that those who do early childhood education are well-qualified for the job. After all, one justification for such programs is to help children who would otherwise have already been lagging behind in kindergarten and first grade to be school-ready. A National Academy of Science report in 2015 recommended that all lead teachers working with children from birth through age 8 should have at least a four-year bachelor's degree. On the other side, these jobs don't have high pay, and aren't likely to have high pay in the future. Thus, the dilemma is that it doesn't make economic sense to require someone to go through a lengthy and potentially costly training program to qualify for a job that doesn't have especially high pay. four-year public institution costs about $18,600 a year. That is a steep entry price for a profession where hourly wages average less than $10 an hour. McCarthy suggests a structured and organized two-year apprenticeship program instead, which would lead to outside evaluations and a certificate of completion, and points to a pilot study in Philadelphia for evidence of workability. She makes a very strong case. Requiring a college degree for early childhood education workers is not likely to raise wages for those workers. "The working conditions of early educators, meanwhile, are also unlikely to be affected by a degree requirement. The system of funding in the early education field—not the perception of its teachers—is what drives its fragmentation and decentralization. A degree requirement will not make state and local school systems expand the size and scope of their early childhood education centers, where working conditions and pay tend to be better. Nor will it change how federal and state programs channel their funding for early education through a decentralized system of public and private early education centers. Unless those funding sources, particularly the public programs, move toward more school-based provision of early education, there is little reason to expect a degree requirement will spark a recalibration of the early education market." A college degree is an inefficient way to learn the specific jobs skills needed for a job working with very young children. "A bachelor’s degree is a very time-consuming credential to earn. It is also a remarkably inefficient way to equip early educators with the knowledge, skills, and competencies outlined in the National Academies report and identified by key stakeholders like the Council for the Accreditation of Educator Preparation (CAEP) and NAEYC [the National Association for the Education of Young Children] ..."
Requiring a college degree for early childhood education would have the effect that those working in these positions are younger, whiter, and tend to come from families with higher income levels. "In other words, we can expect that the workforce will become more stratified along race, income, and age. Early childhood educators holding degrees are more likely to be young and white, and educators without degrees more likely to be older and from communities of color. That is the case for our elementary teaching workforce, which is more than 80 percent white. A bachelor’s degree requirement has the potential to reduce the likelihood that children from low-income and racially diverse backgrounds will have teachers from their communities." I agree with the broad direction of McCarthy's proposal, but the application of this insight extends well beyond workers in early childhood education. A substantial number of those who graduate from high school have no reason to view additional academic classwork with anticipation or enjoyment. Throughout their K-12 school careers, they have mostly been in the bottom half, or bottom quarter, of the academic distribution. If a job requires additional years of classroom study, it will appear to them as a heavy burden and a strong discouragement. For many of these students, a well-structured rigorous learning-on-the-job program will be a more attractive option. Our economy needs more alternative career pathways that don't require piling up academic degrees as a starting point. Labor productivity performance in the United States has been dismal for more than a decade. But productivity slowdowns—even lengthy ones—are nothing new in US economic history. This Policy Brief makes the case that the current slowdown will come to an end as a new productivity revival takes hold. The essay spells out details behind these claims. Here are a few of the comments that caught my eye. Past methods for adjusting for the improved quality of microprocessors may not be working well at capturing changes in the last decade or so. newly introduced model is much greater than its predecessor. quality change is taken into account. Although conventional tangible business investment is down as a share of GDP, intangible investment is on the rise. In fact, the overall investment share of both tangible and all intangible capital has been relatively stable since the late 1970s. This conclusion is not surprising in an economy in which the newest technical capabilities and products rely at least as much on intangible capital as on tangible capital. This feature surely characterizes leading companies such as Google, Amazon, Facebook, and Microsoft. Even industrial companies like GE are increasingly investing in big data, predictive analytics, and machine learning. "robust federal investment in basic science"
"immigrant scientists and entrepreneurs play a disproportionate role in driving the technological advances that power productivity growth in the United States"
"globalization of invention presupposes the continuation of an open global trading and investment system supported by the United States"
in this direction could yield rich dividends in the form of much faster, more cost-effective human capital formation." even more rapid productivity growth."